Disclaimer: We cannot guarantee that the Specs/Price of Air Conditioner on this page is 100% correct (Human error is possible). For correct info. always visit the nearest local shop. 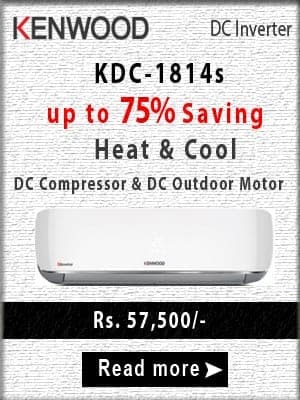 This price is valid in all cities of Pakistan including Karachi, Lahore, Islamabad, Faisalabad, Multan, Rawalpindi, Hyderabad, Gujranwala, Bahawalpur, Peshawar, Sargodha, Sialkot, Quetta. PriceCity.com.PK was founded in Jan 2016. We help our valuable users, what to buy and where to buy mobiles phones, Electronics, Home Appliances, Cameras, Laptops, Cars, Bikes, etc with detailed specifications, price, and reviews. © 2019 PriceCity.com.PK. All rights reserved. All logos/trademarks/brands are the property of their respective owners. Reproduction of Contents is strictly prohibited.